Harrogate on the cusp of the Yorkshire Dales is going to be the home of a number of retreats aimed at creative types in a number of different mediums. Writers in particular are being invited along to a two-day all-inclusive Short Story Workshop Creative Retreat at the 4 star Country Living St George Hotel from March 8 to 10th. The cost of the retreat is £500 and includes all accommodation and food, as well as the workshop, which is being run by Jem Henderson. The day rate for attending teaching sessions but not staying over is £190. Jem has an MA in Creative Writing from York St John University and has been published in Wyrd Words and Effigies, Beautiful Scruffiness, Down in the Dirt, The English Chicago Review, The Night Light and various publications online. During the workshop Jem will guide attendees through exercises, free writing time and discussion sessions, leading them toward achieving their writing aims. ​The Short Story retreat will also include sessions on place building, creating characters and getting creative work published. Run by podcast host and experienced crafter Mel Browne, Creative Escape is an opportunity for you to develop new skills or improve the ones you have, meet like-minded people and relax amid the beauty and inspiring scenery of North Yorkshire. For more information visit the website or contact mel@creative-escape.org.uk or call her on 07825 337809. Riley Anderson has always been smitten with his older brother’s best friend, Kai Brandt. But Kai is straight and he and Riley have nothing in common. Riley’s a desk jockey and hunky Kai is obsessed with the great outdoors, just like the rest of Riley’s family. It’s bad enough that Riley is forced to go camping for his dad’s 50th birthday. Even worse when gorgeous Kai shows up too and Riley isn’t sure how long his crush will remain secret. Kai always liked his best friend’s cute but shy little brother. When they reunite after a few years apart, Kai is surprised to find that Riley has grown up…and Kai can’t get him out of his head. Maybe now that Riley is an adult they can be friends? When their trip takes an unexpected turn, Kai and Riley find themselves stranded together in the wilderness. The chemistry between them is undeniable. But Riley is too afraid to believe this could be real, even though Kai knows this is no longer just about friendship for him. They don’t have long before they will have to rejoin civilisation. Can they face the truth in front of them before their lives pull them apart once more? Helen Juliet is a contemporary MM romance author living in London with her husband and two balls of fluff that occasionally pretend to be cats. She began writing at an early age, later honing her craft online in the world of fanfiction on sites like Wattpad. Fifteen years and over a million words later, she sought out original MM novels to read. She never thought she would be any good at romance, but once she turned her hand to it she discovered she in fact adored it. By the end of 2016 she had written her first book of her own, and in 2017 she fulfilled her lifelong dream of becoming a fulltime author. She also writes contemporary American MM romance as HJ Welch. Just a quick note to let you know about a great sale on Open Net, Cayuga Cougars #2. For one week only, from April 24 thru April 30, you can get August and Sal’s book for only ninety-nine pennies. This book has an age difference, a sweet and tender young goaltender, an older HIV+ love interest, and plenty of action both on and off the ice. Augie, as his friends and teammates call the unassuming young goaltender, is on the fast track to the pros. The starting goalie for the Cayuga Cougars, he has a year or two in Cayuga to hone his skills and all his career dreams will have come true. Pity his personal life isn’t riding the same high. He’s the only one among his group of friends without that special someone to call his own. Until he meets Salvatore Castenada at a lakeside party. The attraction is white-hot and more than a little wonderfully overwhelming for the romantically inexperienced goalie. August quickly discovers that Sal is everything he’s dreamed of in a man: mature, settled, sinfully handsome, and filled with gentle humor. Sal is also HIV positive. THE CARINA PRESS EDITORIAL TEAM IS HOLDING THEIR ANNUAL PITCH EVENT ON TWITTER VIA THE #CARINAPITCH HASHTAG TODAY FROM 9AM EASTERN TO 9PM EASTERN. New for 2018: Editors are open to proposals during #CarinaPitch. You do not need a complete manuscript to participate this year! The publishing house has requested revisions on and/or signed to publication more than forty manuscripts via #CarinaPitch since holding the first event five years ago. Their ultimate goal is always to find new authors to acquire, not new authors to reject, so get those pitches polished. Today Carina Press editors will be monitoring the #carinapitch hashtag for book pitches from authors. If a book pitch is favorited/liked by an editor, that editor will review the full or partial manuscript, whichever is available. Editors will respond with personalized feedback to all #carinapitch projects they request and receive. All authors who receive a #carinapitch request will receive a response by July 13, 2018. **Please note that they ask authors not to expect paragraphs of critique, but specific feedback will be offered, noting what the editor sees as not working or needing attention. **Carina Press also would like to emphasize that the nature of this business is subjective, so the editor may provide feedback the author may not agree with. They’re offering insight into why the book doesn’t work for them (should they choose to pass on it, rather than acquiring, which is certainly a possibility! ), not providing detailed instructions on how to “fix” any issues they see. 2) You must be prepared to send your materials by May 28, 2018. Any materials sent after midnight on Monday, May 28th will still be fairly reviewed by editorial staff but won’t be eligible for the feedback. 3) The project you’re pitching must be new material, not previously published material, whether self-published or released via a publisher. Only new material will be considered during this event. We define previously published as something that has been available for sale or free download on a retail site. If your book was placed on Wattpad, critique sites or other similar crowd-reading sites, we do not consider that as previously published. 1) Wait until April 18th from 9am Eastern to 9pm Eastern, which is when the editors will be monitoring the hashtag. 3) Post them to Twitter from your public* account using the #carinapitch hashtag (the only way they’ll know they’re for them!) They also suggest using genre hashtags, listed below, to further categorize your submission. *If your Twitter account is locked/private, they will be unable to see your posts on the hashtag or any @ replies you direct to them. Tweets from private accounts are ONLY viewable to those friends with the account. Your account must be public to participate. 4) Please do not post pitches for one book more than twice during the #carinapitch event. Even if you’re changing your pitch, please pitch the same book no more than twice during the day. Don’t worry, they’re reading every single pitch, so as long as you post it once, they’ll see it! Twice gives you the opportunity to change things up. 5) Watch for a reply/like/favorite from a Carina Press editor. Please follow the submission guidelines here and include all required information via the received Submittable link. NOTE: For proposals, you must follow submission guidelines as outlined here. If more than one editor asks for your submission, you may choose which editor to send to, though you may also wish to indicate the second editor who had interest, in case the first editor decides another editor would be better suited for your particular manuscript. Send your submission no later than midnight Eastern time, Monday, May 28, 2018. The link you receive will expire after that, and you will be unable to submit via this route. Update your submission no later than Monday, May 28th at midnight Eastern. You don’t need to direct your tweet to a specific editor. They will all be monitoring the hashtag throughout the day. However, if you want to bring it to the attention of an editor you think it’s particularly suited for, you are welcome to do so. At the bottom of this post is a list of participating Carina Press editors and their Twitter IDs. Please don’t post your pitch more than twice during the day. Carina knows you want to make sure they see it, so they don’t mind if you post it at two different times, but please don’t post one manuscript more than twice. Though you are welcome to craft each pitch differently, please don’t post any 1 project more than twice, regardless of wording. Two pitches per project, so the hashtag doesn’t become cluttered, and so that all authors have equal opportunity to be seen. Don’t worry, we will see your pitch and consider it, even if you only post it once. Thank you! You can find out what our editors are looking for by clicking here. You can see editor bios here. Feedback is welcome! Please email us at editor@carinapress.com if ever you have specific, constructive feedback you’d like to share. Use genre hashtags! We’ve listed a few for you at the bottom of this post! If your pitch isn’t selected by an editor, that doesn’t mean your project isn’t right for Carina. In the end, it’s the story that will get them to acquire the book, not the pitch, so if you’ve written something they publish, please still submit it to them. They’re always open to submissions, from agented or unagented authors. 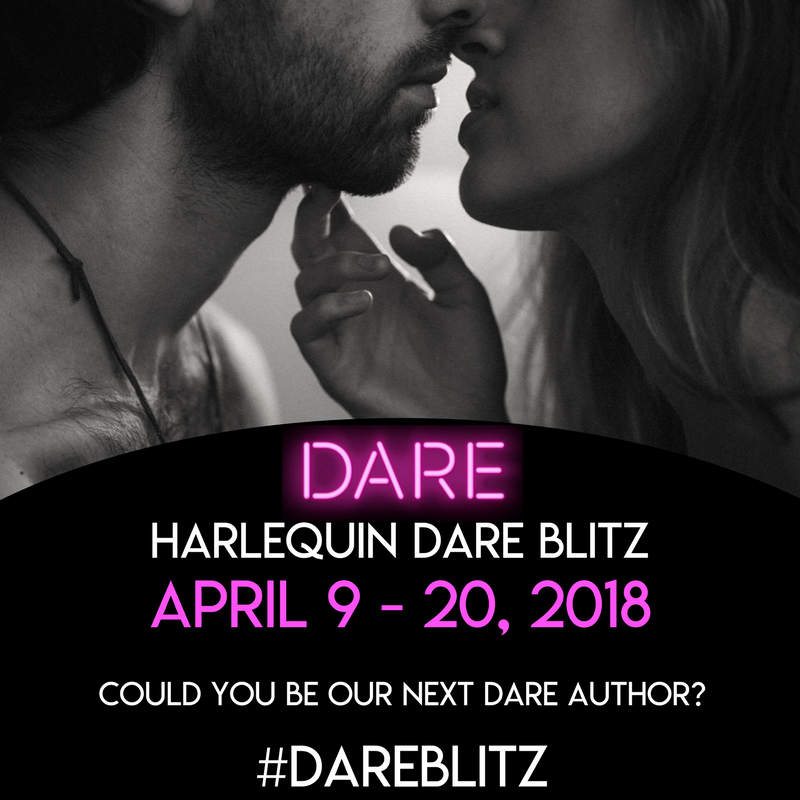 Harlequin’s DARE imprint is actively seeking new authors, which is a great chance to showcase your writing skills and get some fast editorial feedback! Harlequin DARE is the sexiest MF series yet, publishing red-hot romances that push the boundaries of sexual explicitness. If you like writing steamy editorial where alpha heroes meet their match in strong, independent heroines, Harlequin wants to see your submission! Don’t miss out on the chance to grab 15 free spooky and steamy Halloween romances from authors including Kay Simone, Sloane Kennedy, Charlie Cochet and Lucy Lennox.